Alabama's economy is driven by a variety of industries and agricultural industries all of which influence commercial real estate listings in the state. A variety of crops are grown in the Alabama, ranging from peaches and peanuts to such staple crops as corn, soybeans and grains, which drives strong demand for commercial rural land. Alabama's industrial sector is diverse with automotive manufacturers; such as Honda, Toyota, and BF Goodrich Tire. These companies and their industrial space have a large presence in the state. Steel production, lumber and NASA's George C. Marshall Space Flight Center are all major fixtures in Alabama's economy. Thus, industrial space is plentiful in the region. Major cities include Birmingham, Mobile, Huntsville and Montgomery. Those interested in commercial real estate listings will be interested to learn that the state's population has grown considerably since 1990, jumping by nearly 20% in the last 20 years. Alabama's largest city is Birmingham with about 210,000 people, according to the 2010 Census, and the state capital is Montgomery. Office space, commercial property, retail space and investment property have all grown alongside Alabama's general population growth. Commercial real estate listings are plentiful in Alabama's largest cities such as Birmingham and Montgomery. Spacious 6,600 SqFt Restaurant With Retail And High Traffic Nearby! Located just 1 block from Huntsville Hospital!! GREAT LOCATION!! 20,000+ SqFt Office Building In Madison Business Park! Great Location! 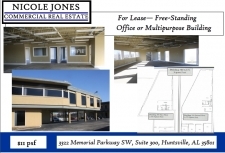 6,500 SqFt Office Building In The Heart Of Huntsville's Medical District!! New Retail Center With Spaces To Lease! Great 24,000 SqFt Office Building In Business Park! Great 25,000 SqFt Office Building In Business Park! 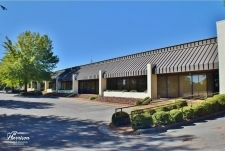 22,000+ SqFt Office Building In Madison Business Park! Great Location!! 40,000 Square Foot, Class B Office Space Available. Located In Cummings Research Park. Class A Office Space In The Heart Of Scottsboro! For Lease! High traffic Retail Strip Center Located At 2601 N Memorial Parkway and Max Luther Drive! 12,000 Leasable Square Feet Located In Cummings Research Park East On 3.5 Acres!